We all think to clean our bathrooms, organize our pantry and refrigerator, wash our cars, and as you know the list goes on and on. However, many of us forget about a place that in most cases are pretty out of control. That one place is our Pinterest page. Oh Pinterest. How I love you. With that said Pinterest has also become my source of anxiety at times. It can be so overwhelming and SO. VERY. TIME CONSUMING. Luckily about a year ago I limited myself to a certain amount of pins a day. That way I can be inspired, I can learn from others, and I can find some incredible blogs and websites, but it will not consume my day. This has helped tremendously. There was one problem I still faced. And that was I have to organize what I currently have pinned. So I started organizing a few months ago and I feel better already. Just like anything else that needs to be organized...you have to continue to organize and reevaluate. You cannot just organize a pantry once and walk away. You have to maintain it and evaluate it every once in awhile. That is what I am doing. So in a simple one step answer. I go through one board a day! You can choose how you want to organize from there depending on your organizing style. I plan on going through all of them and doing the same thing in all of them as I go through them daily. Then once I am through them all I will start back at the top and do a different task in each of the boards. Skim through board and look for duplicates. I am on this task right now. I am quickly skimming through the board and looking for duplicates. Pinterest updated the website to where you will get a warning if you have already pined a certain pin. Unfortunately, that was not a feature when I started using Pinterest. So I have quite a few duplicates. On one board I found quadruples. Now realize I am quickly skimming. I do not have a lot of time to go through slowly. So I might miss a few. That is where continuing to organize comes in. Next, check to see if a pin will fit better in a different board or if you have a lot of the same type of pins in one board and you could make a more descriptive board for those similar pins. For example, I have a "Learning" board. There are all sorts of school/learning pins under this board. However, I had a lot of shape, color, letter, and number pins under that one board. So I made 4 new boards ("Learning-Shapes", "Learning-Colors", and so forth) One thing I wish Pinterest would do is to make sub-boards. That way I could have my Learning board then click into that and there would be "sub-boards" within that board. Then all my learning boards would be in one space. Which brings me to my next task. Arrange your boards so it makes sense to you. I have already done this twice. I keep switching them around. Right now I have all the like boards next to each other (since I cannot have sub-boards this is the next best thing for me). For example, all my food boards are right next to one another (General food ideas, soups, crock pot, drinks, appetizers, breakfast, freezer meals, and so on). Make your cover picture for each board a great representation of what would be found on that board. Randomly pick pins and make sure they do not contain broken links. If they do then you can research and see if you can correct it and if not then get rid of it. If you are like me then you have so many pins that you cannot dwell on each one too much. It would consume you. Last, start again. It is good to continue to organize because your views and life change. You might not need baby stuff pinned after you are done having babies. You might not like the look of the kitchen you pinned years ago. That way you can purge, but you can also rearrange your pins into boards that make more sense as you change. 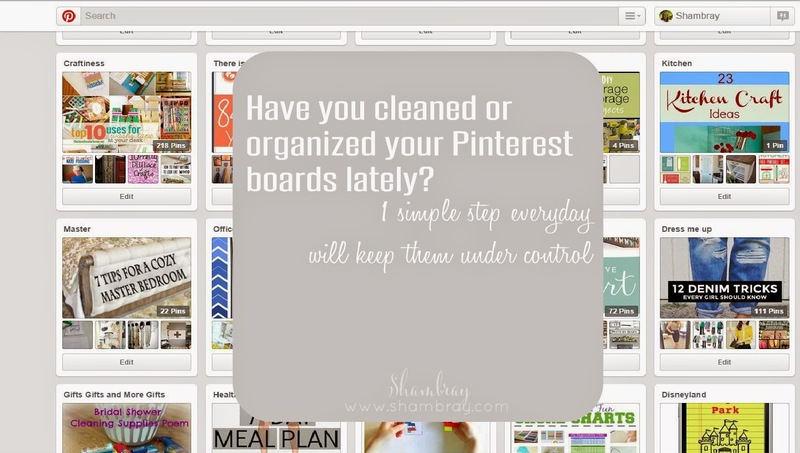 While you are doing all of these tasks look into the pins and become inspired by what you pinned. You pinned each pin for a reason. So use them. Make a goal to look at a certain number of pins a week and make that craft, prepare that delicious dish, do that activity with your kids, or surprise your love with that awesome gift. Whatever it is utilize those pins and be happy with the fact that you accomplished even one of them! Have fun. Pinterest is meant to be fun. It is meant to inspire and to help you. It is a fabulous resource so make it one!